During my E3 trip, John Owens, the CEO of Wee Man Studios and Rebecca Owens, Wee Man’s Marketing Director, gave me a sneak preview of on their fast paced, heart pounding, racing game: Lifespeed. Lifespeed will be available for the Nintendo 3DS and reminds me of one of my favorite childhood games, Starfox. In a galaxy far, far away, planets are fighting over resources to survive and war is settled on the race track. If you die, your planet’s population will be wiped out and the planet will be stripped of its resources. 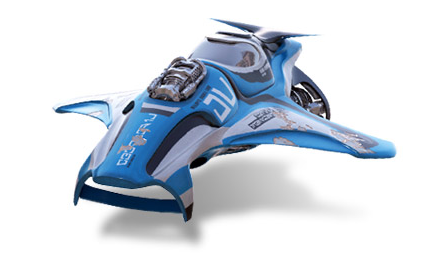 If you win the Lifespeed championship, you will get the chance to race against the leader. In the top Nintendo 3DS screen, you compete on the race track, maneuvering your ship through rings for pick ups, and you can use these pick ups to give yourself an edge over your enemies. Some of these pick ups include weapons like missiles or turrets to place on the back of your ship. In the bottom screen, a map of the track is displayed, and this is where characters pop in to chat with you. The game will be released in 3 episodes, which will include online leaderboards, and eventually, an online multiplayer system. As I was chatting with John, I wanted to know an interesting fact about Wee Man Studios. He hinted at Wee Man Studios being a very small company and only had 6 people involved with the making of the game. Lifespeed is being polished for the Nintendo 3DS and the release date is estimated for September 2015. Update: It will be available in the US for $5.99 and €4.99 in Europe. You can learn more about Lifespeed on their website, weemanstudios.com, and you can follow their Twitter account here: @weemanstudios. If you want to stay updated on more Gamer Compatible reviews, you can follow us on Twitter: @gamercompatible or on Facebook: @gamercompatible. Images were taken from the Wee Man Studios website. This entry was posted in Articles, Interviews and tagged 3ds, fast, game, lifespeed, man, nintendo, paced, racing, studios, wee. Bookmark the permalink.